Attis of Phrygia is a figure that provides mythicists with several points of correspondence. 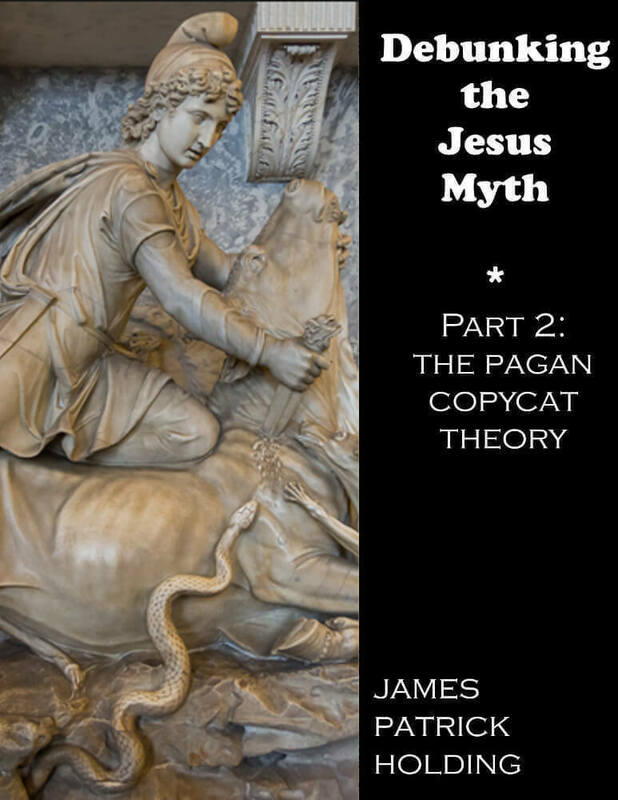 In this case, however, scholarship on the subject has already affirmed that Christianity stole nothing from the Attis cult, and indeed, they aver that the opposite is what happened. Vermaseren notes that all of our information on parallels comes from early Christian writers, and refers to “a tendency to add more and more complicated theories to the Phrygian cult in the course of time.”1 Gasparro avers that the sources show an evolution in the Attis cult in response to Christianity.2 A. T. Fear, in an essay devoted entirely to this subject, notes that the Attis cult “did modify itself in significant ways with the passing of the years” and concludes, based on the dated evidence, that the ways of the Attis cult similar to Christianity “seem to have been provoked by a need to respond to the challenge of Christianity.”3 Let’s now see how that works out with reference to specific claims. December 25th is of no relevance; again, that date was not chosen as the birthdate of Jesus until many centuries after his Resurrection. Even so, I have found nowhere any indication that this date was associated with Attis in any way. Despite the footnote to Godwin’s text at the end of this sentence by Freke and Gandy, Godwin makes no such assertion in his text; what Godwin does say is that “what they ate or drank we do not know”—not a word is said about it being “likely” bread and wine. Vermaseren, the dean of Attis studies, adds more.9 Vermaseren confirms the use of the cymbals, and the eating and drinking, but suggests that milk was the drink of choice, because wine and bread were forbidden during the Attis festivals; so, if wine and bread were the meal of choice, it would have had to have been an exception to this rule. Nevertheless, all of this information comes from Christian writers…and at best would reflect the sort of communal meal all ancient societies ate (being that bread and wine were by far the most common ancient staples). It is certainly true that Attis’ priests were eunuchs; they emasculated themselves in imitation of Attis, who, in later stories did this to himself out of grief. However, the priests also cross-dressed, flogged themselves, and danced in a frenzy.10 They did not emasculate themselves “for the kingdom of heaven” (the term is unknown in this context), but in imitation of Attis as an unwitting hermaphrodite (see more below). This does not match any Christian view, so it is difficult to understand why anyone finds a parallel. Attis is obviously a divine grandson of Zeus, but the title “Divine Son” is nowhere applied to him. As to being a Father, he never was one in the stories, but Frazer indicates that his name “appears to mean simply ‘father,’” and in this context he was the consort of Cybele, the mother goddess.11 No later scholar repeats this idea. Gasparro notes some representations of the infant Attis seemingly as the son of Cybele,12 but at best all we have here is a correspondence of very common familial terms, and Attis had to be someone’s son. I have found no verification for any of this. Attis died under a tree, not crucified on it; there is no reference to it happening on a Friday, much less a “Black” one. Attis did shed blood, but all it did was make flowers, in some stories. Whether Jesus actually did this is open to discussion; it is beyond the scope of this chapter to decide. However, several forms of ancient religion held that many people descended to the underworld after death, so Attis was hardly unique in this regard. On March 22nd, a pine tree was felled and “an effigy of the god was affixed to it, thus being slain and hung on a tree....” Later the priests found Attis’ grave empty. consents minimally: Attis’ body remains uncorrupted, his hair continues to grow, and his little finger moves continuously. In another story, Cybele falls in love with Attis, who prefers a nymph. Cybele kills the nymph; Attis goes insane and emasculates himself; from his blood, flowers grow out of the ground, and he turns into a pine tree. In yet another story, Cybele, who unknown to herself is the daughter of a king, marries Attis; when the king finds out about this, he kills Attis and makes sure the body is never found. Clearly, there is no resurrection here. Signs of such a doctrine come later, after Christianity gets going; as Fear says, resurrection is a “late-comer to the cult.”15 But in this case we do have some connection with the dates given (though as with Dec. 25th, Mar. 25th is a much later choice of the church with no Biblical verification or apostolic roots). Based on a calendar dated to 354 A.D.16 there were six Roman celebrations to Attis…all in the second half of March. One on March 22nd was indeed as related—a pine tree was felled, and the figure of Attis attached, although it represents his death under the tree with the figure being affixed to the tree, therefore being no more than a matter of practically depicting the scene, since the figurine of Attis isn’t just going to float along while the tree is carried by the processioneers. Followers of Attis practiced the taurobolium, or bull-sacrifice, in which the initiate was “born again” when he was bathed in the blood of the bull (or sheep). The taurobolium as a rite of salvation is not attested until much later than the start of Christianity.20 The slaying of a bull for any purpose is known as early as the second century B.C., outside the Cybele cult; it is attested with reference to Cybele only in the second century A.D. A detailed description of the rite is found, dated 245 A.D., in Rome…but the first description of the taurobolium as having “saving” power is not found until the writings of Prudentius dated 400 A.D. (corresponding to the same time that the March 25th celebration shows up). Prior to this, the rite was only done for the sake of the health of the emperor21, having no significance with reference to personal sin. M. J. Vermaseren, Cybele and Attis: The Myth and the Cult (Thames and Hudson, 1977), 182. Sfameni Gasparro, Soteriology: Mystic Aspects in the Cult of Cybele and Attis (Brill, 1995), 106. A. T. Fear, Cybele and Christ in Cybele, Attis and Related Cults, Eugene Lane, ed., (Brill, 1996), 41-2. Vermaseren, op. cit., 4, 9. Maria Lancelotti, Attis Between Myth and History (Brill, 2002), 110. Earl Doherty, stymied by the lack of evidence for an Attisian soteriology, tries to wend his way around this by saying that a proposition that the Attis cult offered no comfort leaves one “at a loss to explain why such myths and their attendant rituals—equally barren of comfort, presumably—kept the Attis cult, and others, vibrantly alive for centuries and indulged in by millions.” <http://jesuspuzzle.humanists.net/supp13B.htm> Accessed April 15, 2008. It is not said where Doherty gets the figure of “millions” from, but it seems odd that he says this as someone involved in a belief system—atheistic humanism—that offers no such “comfort” itself. Why not suppose that the Attis cult offered some sort of comfort for this life instead? In any event, Doherty is clearly trying to create evidence out of non-evidence. Timothy Freke and Peter Gandy, The Jesus Mysteries (Three Rivers Press, 2001), 50. The authors cite page 28 of J. Godwin, Mystery Religions in the Ancient World (Thames and Hudson, 1981). I checked this citation and found no such quote as described. James G. Frazer, Adonis, Attis, Osiris (University Books, 1967), 281. Gasparro, op. cit., 57; Lancelotti, op. cit., 160. A contrary view, offered by Vermaseren (The Legend of Attis in Greek and Roman Art. Brill, 1966), 47, interprets pictures of Attis only dancing, as early as the 4th century B.C., as somehow celebrating his release from death; followed also by Robert Price, Deconstructing Jesus (Prometheus Books, 2000), 91, who says that dancing is “the traditional posture of [Attis’] resurrection.” However, proof of release from death, not just proof of dancing, is required; otherwise the evidence, at most, just as well indicates that later Attis cultists assimilated an episode of dance into their mythology—an episode which may have been for any number of purposes. Why, other than that it is what Price wants to be true, should it be assumed what the specific purpose of Attis’ dance is? about twenty or so each, if each individual use is counted; or just over a dozen times each, if clustered references are counted just once (e.g., Christ is said to be “risen” or “raised” 6 times in 1 Cor. 15). Vermaseren, Cybele and Attis, 102-3.